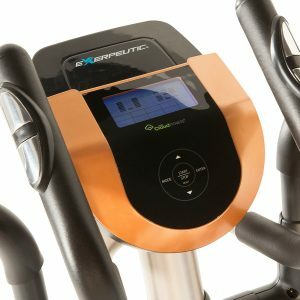 Exerpeutic GOLD 2000XL ST (4320) is a solid and modern elliptical trainer for training your lower and upper body at home. It comes with the Bluetooth technology, a fitness tracking app, and 21 preset exercise programs. Thanks to the robust high-grade steel frame construction it can carry a total weight of up to 275 pounds. And people between the heights of 5’1” and 6’4” so it shall be fine for most of the adults. It has an exposed precision-balanced flywheel that is bigger and roughly twice heavier than the Exerpeutic 1000XL model, the V-belt drive and a three piece high torque cranking system for consistent pedaling. So you will enjoy very smooth and quiet riding experience with a natural elliptical motion. You can actually stride both forwards and backward so you can hit slightly different parts of your major muscles. You will enjoy a zero impact workout without any harm to your joints, knees, ankles or hips, unlike the usual treadmill and bike workout. There are three exercise goal settings for calories, time and distance. The dual action arms will help strengthen and tone your upper body muscles, like shoulders, back, biceps and triceps. You can adjust the magnetic tension through the display panel to 16 different levels of challenge from very easy to very difficult. It has a large and very visual backlit LCD display that is easy to read and manage and shows the usual stats like distance, calories, time, speed, as well as the rpm, pulse, watts and odometer and two user profiles. So you can monitor your progress and stay on target to achieve your goals better. And the AC adapter is included in the package. There is a convenient smartphone and tablet holder for your entertainment during your workout. It works quietly so you can easily listen to music or watch TV while you’re working out. As a heavy-duty product, Exerpeutic Elliptical weighs 81.6 pounds and measures 53 x 25 x 63 inches. It is easy to put together and comes with transport wheels for easier relocation and storage. You will find the pulse pads on the additional fixed handlebars in the middle and you can monitor your target heart rate during your session. Your feet will not slip during your workout thanks to the integrated rib design on the large pedals. It is offered with a year of limited warranty by the manufacturer. This is a very good quality product by Paradigm Health and Wellness with brands like Ironman, ProGear and Fitness Reality.